Middle White swine originated in the Yorkshire area at about the same time and from the same general stock as the Large White and Small White breeds. Mainly, it was a selection for the intermediate size that caused it to be classified as a separate breed. The Middle White has many of the same general characteristics as the Large White except for size and a much more dished face. It is more early maturing than its large relative and hence, more valued when the object is to produce lightweight marketable pork in a relatively short time. At the Royal Smithfield Show, average weights were 61.8 kg at an average of 17 weeks. The white-colored swine are well balanced and meaty. They are usually bred straight in England and have not captured much of a share of the commercial market. The breed is found scattered over England today, but has been generally declining in popularity. When crossed with the Large White, they have been successfully incorporated into commercial operations. 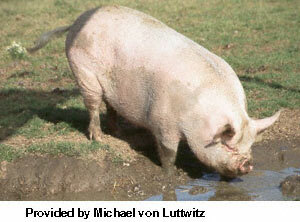 Despite their smaller size, the sows have been found to rear an average of 8.15 pigs per litter. They are good mothers and are known for their quiet nature. There has been little or no export demand for the breed whose history closely parallels that of its relative, the popular Large White. Middle White swine are registered in the National Pig Breeders Association, 7 Rickmansworth Road, Watford, Herts WD1 7HE, England.